Ahead of Tuesday's primaries, the Republican race for Senate District 8 has turned into easily the most expensive — and arguably the nastiest — primary for state office. Nearly a year ago, Phillip Huffines began a campaign for Texas Senate District 8, betting that the incumbent would vacate the seat to run for Congress and that Huffines, a deep-pocketed businessman, had a chance to clear the field. One of those things came true: As widely expected, state Sen. Van Taylor launched a bid to replace retiring U.S. Rep. Sam Johnson, R-Plano. The other thing — not so much. After two other Plano Republicans, state Reps. Jeff Leach and Matt Shaheen, considered running and ultimately opted out, an unexpected name surfaced: Angela Paxton, the wife of Attorney General Ken Paxton, who previously held that seat. A longtime educator, she was a beloved figure among Republicans in Collin County, where most of the district is based, and the thinking was she could provide a sharp contrast to Huffines, who was the Dallas County GOP chairman at the time and had to move into the district to run for the seat. Within weeks of her name coming up in August, Angela Paxton jumped into the race, backed by Leach, Shaheen and dozens of other GOP officials from Collin County and across North Texas. Several months later, the race has turned into easily the most expensive — and arguably the nastiest — primary for state office on the ballot Tuesday. Bludgeoning each other on the airwaves, the two have disclosed spending almost $9 million so far — over $6 million on Huffines' part — a tally that is expected to top $10 million by Tuesday. It could end up being the most expensive primary for a Texas Senate seat ever. With neither candidate’s ideological credentials in doubt, the race has divided some of the most powerful players on the far right in Texas — and two of the most prominent families in conservative circles. Huffines is the twin brother of Dallas state Sen. Don Huffines, who unseated fellow Republican John Carona in 2014 after another brutal brawl with a staggering price tag. The Huffines name is well-known in North Texas, plastered on car dealerships and real estate throughout the region. Huffines wasted no time using the reach of that business to blunt questions about his roots in SD-8, even before Paxton got in the race. Paxton and her supporters have argued that business interests in the district are not good enough, stressing the need for electing a state senator with deeper roots in booming Collin County, which makes up over 85 percent of the district. The rest lies in Huffines’ native Dallas County. It’s a point Paxton has been pressing up through the final days before the primary. “It is not the time to go from having a resident senator to having no resident senator at all,” Angela Paxton said in a radio interview Sunday afternoon. Huffines was not persuaded. After chairing the Dallas County party for about 15 months and being credited with turning around its finances after his predecessor left them in shambles, he stepped down on Nov. 20 to focus full-time on the Senate race. For months, the primary was relatively calm and cordial. That began to change in January. As with many recent flare-ups in the race, who went negative first is the subject of some debate. But by the end of the month, the campaigns were sparring over several donations that Huffines, a prolific GOP donor, had made years ago to Democratic lawmakers. They represented a small fraction of Huffines’ total giving over the years, but Angela Paxton’s campaign pounced on them to sow doubt about his credibility on one of the most important issues in a Texas GOP primary, tying him to "pro-abortion Democrats." It was a quaint critique compared to what would come next. 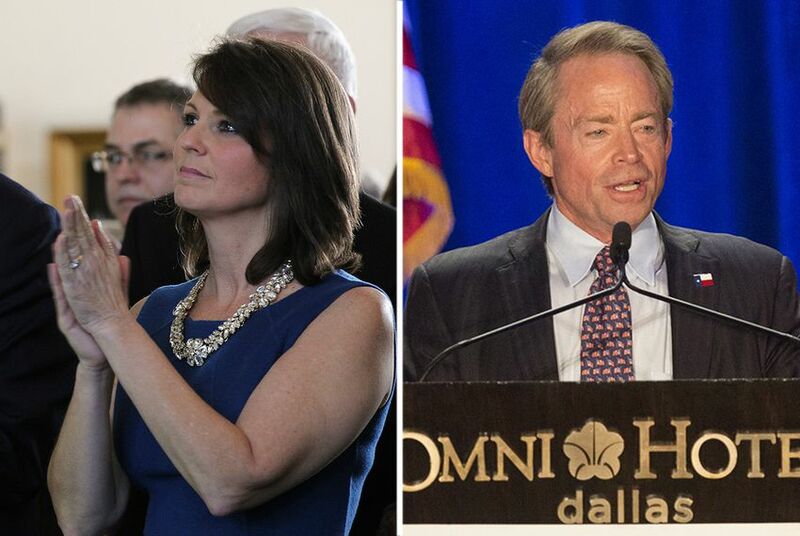 With Huffines pouring millions of dollars into his campaign, Angela Paxton sought to level the playing field, getting a $2 million loan guaranteed by her husband. The arrangement helped fuel Huffines’ most personal line of attack yet — that both Paxtons were using public service to enrich themselves, not just with the loan but also with Ken Paxton's growing business interests since becoming an elected official. "Public service pays surprisingly well for Ken and Angela Paxton," a narrator sneered in a Huffines TV ad that showed two bottles of champagne pouring into a single glass until it overflowed. The ad elicited a response from the attorney general himself, who issued a statement saying the commercial was "disappointing because [Huffines] gave his word he would run a clean campaign." Any hope of restoring comity was extinguished by then. Angela Paxton's campaign was also on TV with an ad claiming Huffines was attacking her to distract from his donations to"liberal Democrats who backed Obama and support sanctuary cities and abortion." Huffines' team kept the hits coming with an ominous commercial that zoomed in on Angela Paxton's beaming headshot, questioning what she was hiding behind her "smile" and contrasting it with the "workhorse" voters would get in Huffines. Throughout the race — and especially in recent weeks — there has been something of a third rail: Ken Paxton’s legal troubles. For most of his first term, the attorney general has been under indictment for securities fraud charges, which his supporters have condemned as a political witch hunt. From the moment his wife’s interest in the race leaked out, there was a sense the race could grow to involve the indictment, undermining the argument that it was meritless. Still, the specter of the indictment has persisted. Most recently, a robocall cropped up in the district that made reference to the indictment. Huffines’ campaign denied involvement in the call, but the Paxton team didn’t buy it, pointing out that the call came from a former staffer for a pro-gun group that had donated to Huffines in December. Regardless of the indictment's role in the race, Ken Paxton has argued Huffines' double-barreled attacks on him and his wife have the potential to inflict political damage on him in November. Paxton is unopposed in the GOP primary but faces a Democratic challenge from Justin Nelson, an Austin attorney who has done his part to confirm the attorney general's theory. “Texas Republicans and I can agree on one thing: our indicted Attorney General has abused his office while putting his own interests above those of Texas families," Nelson said in a recent statement, including a link to Huffines' TV ad with the overflowing champagne glass. Amid last month's escalating combat, Angela Paxton’s campaign released internal polling that showed her leading Huffines by 15 percentage points, 47 percent to 32 percent. Twenty percent were undecided. But the race was hardly over if the activity that followed was any indication. Angela Paxton’s campaign went on TV with a fully negative ad against Huffines, branding him “just another politician looking out for himself.” And last week, after the latest campaign finance reports showed Huffines had loaned himself another $2.25 million, Ken Paxton used his own campaign to make a $500,000 loan to his wife’s — that was on top of $2 million loan he had guaranteed to her campaign earlier. The final days of the race have been colored by the decision last week by President Donald Trump to endorse Ken Paxton and six other statewide elected officials up for re-election. Angela Paxton seized on Trump's support for her husband to imply distance between her opponent and the president, writing in an email to supporters that while Trump "supports our Attorney General, Phillip Huffines continues to join with liberal Democrats in smearing him." Huffines responded with a TV ad featuring alternating pictures of him and Trump. "Build the wall," a narrator says over a shot of Trump that then gives way to one of Huffines, the founder and co-owner of Huffines Communities. "Agrees. Phillip Huffines builds them all the time." While solidly red SD-8 is not expected to flip in November, two Democrats are on that party’s primary ballot Tuesday for the seat. One of them, Plano attorney Mark Phariss, has drawn statewide attention — he is best known as one of the plaintiffs who sued to overturn the Texas ban on gay marriage – and has gotten a number of big-name endorsements, including from Julián Castro, the former U.S. housing secretary and San Antonio mayor. The other Democratic candidate is Plano engineer Brian Chaput.